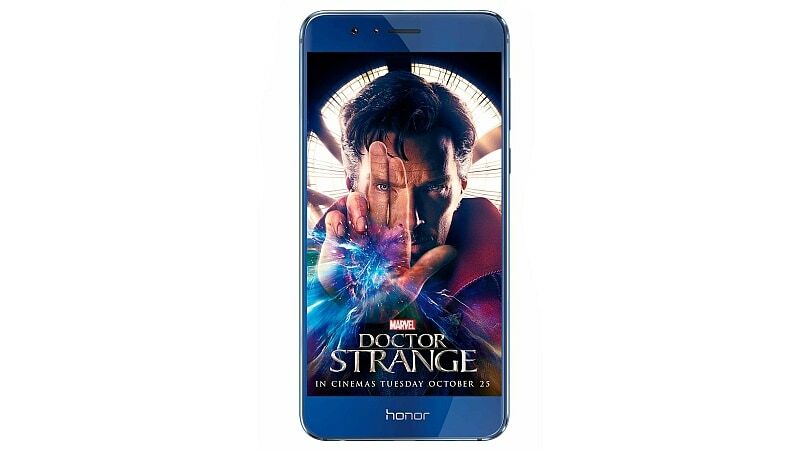 Huawei Terminal brand Honor has announced two special promotions in the UK tied to the release of the Doctor Strange movie later this month. The first will see a limited edition handset with the Eye of Agamotto symbol etched onto the back of the smartphone given to winners of a competition, while the other will see the first registrants of the Honor 8 smartphone on carrier Three UK get tickets to the movie and Marvel movie downloads. As we mentioned, the Honor 8 Doctor Strange limited edition handset will not be available to buy unfortunately. Those interested will have to keep checking the Marvel UK Facebook page until the contest promotion is posted with details on how they can win the limited edition smartphone. You can check out how the smartphone looks below, with an image provided by Honor to Pocket-Lint. The Three UK promotion is a bit simpler, where the first 3,000 registrants of the Honor 8 via the carrier will get two free Doctor Strange movie tickets and four digital Marvel movie downloads via Google Play – Captain America: The First Avenger, Iron Man, Iron Man 2, and Thor. The movies will have to be redeemed before January 31, 2017. The offer is valid for anyone who bought the device between October 3 and November 30 via a Three UK store or online via the Three UK site. To avail of the offer, buyers will have to enter their handset’s IMEI number on the Honor 8 Marvel Offer site, where detailed terms and conditions are also mentioned. In the meanwhile, the Honor 8 smartphone is launching in India on Wednesday at an event in New Delhi. The smartphone was first unveiled in China in July. The biggest highlight of the Honor 8 is its dual-rear camera setup. It sports 12-megapixel dual-rear cameras with dual-tone LED flash and also features laser autofocus. There is an 8-megapixel front-facing camera on board as well. The smartphone sports a USB Type-C port and also supports fast charging. There is fingerprint scanner at the back of the handset. Another notable feature of the Honor 8 is its 7.45mm slim build and that it comes with a metal frame and a glass back. The Honor 8 features a 5.2-inch full-HD (1080×1920 pixels) LTPS LCD display and comes with a pixel density of 423ppi. It is powered by an octa-core Kirin 950 processor clocked at 1.8GHz. The smartphone supports expandable storage via microSD card (up to 128GB). The Android 6.0 Marshmallow-based Honor 8 runs EMUI 4.1 on top. The smartphone features hybrid dual-SIM slot which means users can either use two SIM cards or one SIM card and a microSD card for storage expansion. It measures 145.5x71x7.4mm and weighs 153 grams.